Is Australia’s Vaccine Policy A Nightmare Or A "Pogrom"? The people of Australia are being denied by law one of the most important inalienable rights of human existence, the ability to choose how to take care of one’s children and their bodies, plus the exercise of their basic human right to freedom of choice in healthcare invoking the heretofore scientific-acknowledgement “to cope with possible risks where scientific understanding is yet incomplete, such as the risks of nano technology, genetically modified organisms and systemic insecticides” , aka the Precautionary Principle, to avoid damage from neurotoxic vaccines. 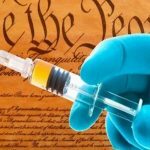 Nano technology and genetically modified organisms are IN vaccines! I hereby challenge Big Pharma and vaccine makers to prove me wrong! Dr. Wilyman’s website is where you can find more definitive information regarding vaccine/vaccination ‘politics’ in Australia. However, Australia is not unique; the vaccine ‘pogrom’ is a global agenda, which has ruined the health of two generations of children globally. Below is important vaccine information presented in Sydney on June 30, 2018, which will help healthcare consumers understand what’s involved in the politics of vaccines. The venue was held secret until a few hours before the presentation so as to prevent it from being scuttled by organized opposition groups who defame all who point to the dangers in vaccines. PreviousAre There Optogenetics, Nano Biology And Blue Light Nexus Health Problems?